There are two ways to apply or distribute sealer to the pavement: by spraying the sealer or applying it with squeegees. Most sealcoating systems on the market today are spray systems. The pricing and effectiveness of these systems widely vary. The overall efficiency of a spray system depends greatly on the amount of pressure pushing liquid through the applicator (typically a hand wand). “Budget” level equipment will typically have a low (100-200 pounds of pressure per square inch), while more expensive “professional” level machines will have more (unlimited) PSI. The higher the PSI the more efficient and profitable the sealcoating operation can be. Visit the Pump Systems page for more information on the different types of pump systems. Higher PSI also allows for greater flexibility. With higher PSI comes options such as using a “distributor bar”. 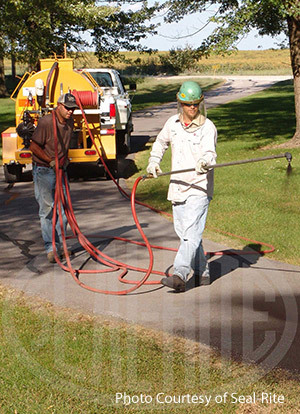 The distributor bar is mounted to the back of a trailer or fixed mounted machine and utilizes 5-8 spray tips to spray material on the pavement at higher speeds. This method is typically used when sealcoating large lots and open areas. It also eliminates the need for a “spray man”. This is by far the most efficient means of distributing sealer. DISTRIBUTOR BAR NOTE: Systems with a theoretical “unlimited” PSI accommodate larger spray tips that allow for greater volumes of sealer to pass through the distributor bar. This, of course, means the travel speed of the system (and thereby the process also) even further increases productivity and efficiency. Higher PSI also means you can accommodate more than one working spray wand and longer hose lengths. There are obvious benefits to having two hand wands working at once, especially on large sealing jobs. With more spray wands, of course, comes more labor cost, so typically this method would be used on medium to large jobs and with machines that have larger material capacities. The benefit of the old fashion method of the “hand squeegee” was that the downward pressure of the squeegee forced the material deep down into the pours of the asphalt. While the spray method is widely accepted and provides long term protection to the asphalt surface for years to come, some project specifications require that at least one coat be applied using the squeegee method. In fact, some specifications – usually on high traffic parking lot jobs – require a combination of both squeegee and spray. The spray method covers the “peaks” of the asphalt pavement and the squeegee method reaches deep down into the valleys of the pavement. There are far fewer squeegee machines than spray on the market today. And while there are a handful of “dual-applicator” machines, there are even fewer “squeegee only” machines. One reason for this is that the spray method is a much quicker process and requires less material. The squeegee machine is also a self contained, self-propelled machine that requires a trailer to transport it from one job site to another. Finally, most squeegee machines have a limited material capacity of 350 - 550 gallons. 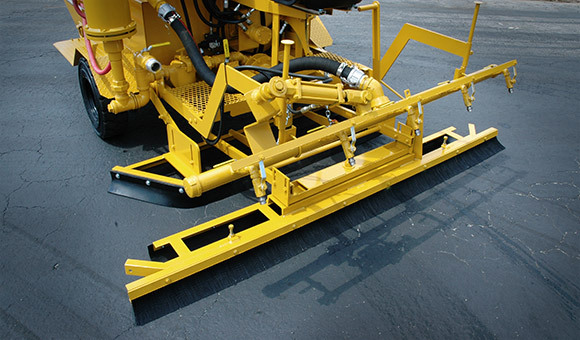 Squeegee systems can also be mounted to the rear of fabricated truck systems. These king sized machines will usually have high pressure spray systems that accommodate a wide array of options – including extended length distributor bars and dual hand wands. These are highly productive machines on large wide open projects like shopping malls and airports and offer the ultimate in flexibility.